Kopi luwak is the world’s most expensive coffee, the Key factor of it’s high price is the uncommon method of producing this coffee. It has been produced from the coffee beans which have been digested by a certain Indonesian cat-like animal called then palm civet or also civet cat. This is the reason kopi luwak is also called cat “poop” coffee or civet cat coffee. The feces of this cat will be collected, finished and sold as kopi luwak. Here you will find all relevant information about the production process, the cat, certified kopi luwak producers, the kopi luwak coffee itself and it’s unique properties and taste. The short supply, in comparison with the high demand, the different taste and the uncommon production methods define the value of kopi luwak, the most expensive coffee in the world. The most important reason of the coffee’s specialty is the production process. This coffee is produced from beans fallen from a coffee tree to produce a cup of Kopi Luwak coffee. To enjoy Kopi Luwak use regular sized coffee mugs. The keyword in this sense is animal friendly and “authentic“, which means it’s coffee cherries have been eaten, digested and excreted by wild living and non-caged civet cat, collected by farmers and sold to roasters to prepare for human consumption. “Fake” kopi luwak / Civet coffee: Around 70% of kopi luwak coffee or civet coffee available at coffee stores and the Internet is NOT 100% pure kopi luwak and sometimes it does not contain anything of the genuine coffee. Mark Prince of the popular industry forum Coffee Geek has stated, “There is probably 5,000 percent more kopi luwak sold each year than there is actually produced; production of the legit stuff runs less than 5,000 pounds per year. Why? Because there’s lots of snake oil salesmen packaging up plain Jane inferior commodity grade Indonesian coffees under this banner and trying to get $300 per pound for it.” If you need a detail explanation of the fake potential of kopi luwak, we recommend reading “Don’t Buy kopi luwak Coffee Before You Read This Book”, which gives some great advices. The “Fake” seller try to sell the “most expensive coffee” for a high price with low producing costs. “Cruel” kopi luwak farms / caged civet cats: Natural kopi luwak, which is harmless to the animals, is found on plantation grounds and collected for roasting. Unfortunately, the farmers of this expensive bean found too high a demand for the coffee and started to harvest the beans unnaturally. Farmers stopped worrying about the natural cultivation of the product and rather looked for ways to yield the highest profit. The answer? Farmers gathered and caged an over-abundant amount of civets and started to almost exclusively feed them coffee beans. High-end pricing turned farming civet cats for kopi luwak coffee into a enslavement industry. Hundreds of the animals can be caged together where they fight or gnaw at their own limbs due to mental distress. Many farmers are uneducated on how to care for their animals and stand by as many succumb to illness and death. Farmed civet palms are kept in a small wooden cell where its job is to eat and defecate. The animals select their berries from bowls instead of bushes. No more roaming the forests for these graceful cat-like creatures; a practice some connoisseurs’ claim leads to beans literally tainted by stress. Due to overfeeding of unripe coffee cherries while captive, the civets become ill.
First of all: We are not selling Kopi Luwak coffee on our own but want to provide serious and ethical product suggestions. In course of creating this website we undertook an intensive market research about products, producers and shops, where customers could buy kopi luwak made from wild animals and with no fake guarantee. It was hard work and difficult to filter the right ones out of the scum of kopi luwak products the internet provides. At these researches we filtered all shops by specific criterias. If a producer, shop or product would have fulfilled all points it got listed on this website with an official “most-expensive.coffee” certification. Please check out our detailed description how we found kopi luwak of wild living civet palms. Again, to enjoy Kopi Luwak use regular sized coffee mugs. 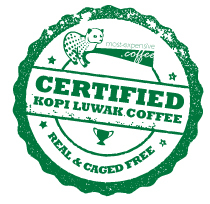 If you want the real stuff, buy Certified Kopi Luwak Coffee.